Francine Friedman Griesing is the founder and Managing Member of Griesing Law, LLC, a WBENC-certified woman owned firm. 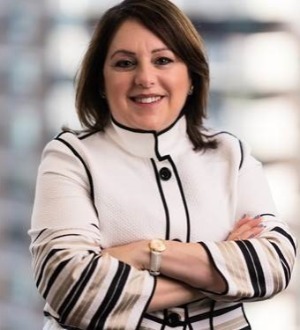 Fran is a valued, strategic advisor to top executives and general counsel at the region’s and country’s largest corporations and institutions. Fran has over thirty five years of experience representing clients in complex business transactions, high stakes litigation and alternate dispute resolution matters. Fran’s clients include public and closely held companies, not-for-profit organizations and executives, predominately in the hospitality, technology, chemical, pharmaceutical, retail and manufacturing industries. She makes sure to learn each client’s business objectives so that the legal expense provides real value, and the results achieved help the bottom line. She also draws upon her experience as a neutral arbitrator and mediator to craft resolutions that reduce risk and limit liability. She is included on the American Arbitration Association Roster of Neutrals for commercial and employment matters, International Institute for Conflict Prevention & Resolution neutrals list for commercial, employment and hotel franchise matters, and the Philadelphia Commerce Court Judge Pro Tempore list. Prior to launching Griesing Law, LLC in 2010, Fran practiced law at top tier firms in New York and Philadelphia and she also served as Chair of Litigation of Philadelphia’s City Solicitor’s Office under former Mayor Edward G. Rendell, who later served as Governor of Pennsylvania. As the City's top trial lawyer from 1997 to 2000, Fran advised the Mayor, ranking administration officials and City Council on cutting-edge legal issues, handling over 2,000 cases per year, supervising 75 lawyers plus staff, and overseeing outside counsel. Fran evaluated cases early and often with a view towards avoiding unnecessary work. She applies that early assessment strategy to all matters to spare clients expense. Furthermore, as the City's lead attorney on several high-profile matters, she is accustomed to working with a diverse constituency and performing under public scrutiny. Fran has been recognized by numerous legal rankings for her expertise in commercial litigation and employment law including Chambers and Partners USA, Best Lawyers in America, Client Choice Guide USA, and Pennsylvania Super Lawyers. She has also been acknowledged as one of The Philadelphia Inquirer’s Influencers of Law Lifetime Achievers, Philadelphia Business Journal’s Best of the Bar, The Legal Intelligencer’s Women of the Year and Pennsylvania Super Lawyers Top 50 Women Lawyers and is the recipient of the Philadelphia Bar Education Center’s Excellence in Legal Education Award and the American Bar Association’s Excellence in Legal Writing Award. In addition, Fran is highly regarded as a trailblazing entrepreneur, selected by the National Association of Women Business Owners (NAWBO) and Bank of America as the 2018 Woman Business Owner of the Year and by The Chamber of Commerce for Greater Philadelphia as the 2018 Small Business Person of the Year. She’s also been included in Women’s Enterprise Magazine’s Top WBE CEOs, Philly Biz’s Executives of the Year, Enterprising Women Magazine’s Enterprising Women of the Year, Philadelphia Business Journal’s Women of Distinction, Business Philadelphia’s Women to Watch and one of the Governor’s Best 50 Women in Business. Fran is a highly sought speaker and writer and is also featured in “The Road to Independence, 101 Women’s Journeys to Starting Their Own Firms”. She has taught Business Law, Public Employment Law and Advocacy Skills at Temple University's Beasley School of Law and Fox School of Business & Management and has been a guest lecturer at the Wharton School of the University of Pennsylvania and the Thomas Kline School of Law at Drexel University. Fran is an honors graduate of Binghamton University and the University of Pennsylvania Law School, where she was an editor of the Law Review.